For other uses, see Del Rio (disambiguation). Not to be confused with Yo La Tengo. Los del Río (Spanish pronunciation: [ˈloz ðel ˈri.o], "Those from the River"), also known as The Del Rios, are a Spanish Latin pop and dance duo which formed in 1962 by Antonio Romero Monge (born 1947) and Rafael Ruíz Perdigones (born 1949). They are best known for their smash-hit dance single "Macarena", originally released in August 1995. The song went on to become a worldwide success. The single "Tengo, tengo" was released on February 18, 1996, and appeared later that year on the album Fiesta Macarena. The group ultimately released six albums: A mí me gusta, Macarena Non Stop, Fiesta Macarena, Colores, Rio y Guestano and Alegria y cosabuena. Five of the albums featured versions of "Macarena", in different styles and remixes. Because of their considerable success worldwide, their native town of Dos Hermanas has named a new municipal music hall, the Anfiteatro Los del Río, after them. 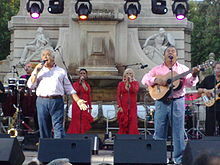 Another well-known song by Los del Río is "Sevilla tiene un color especial," which is featured prominently in the Spanish smash success movie Ocho apellidos vascos. "—" denotes releases that did not chart or were not released to that country. ^ "Los del Rio Album & Song Chart History - Billboard 200". Billboard. Retrieved November 24, 2010. ^ "Los del Rio Album & Song Chart History - Latin Albums". Billboard. Retrieved November 24, 2010. ^ "Los del Rio Album & Song Chart History - Latin Pop Albums". Billboard. Retrieved November 24, 2010. ^ "australian-charts.com - Australian charts portal". Hung Medien. Retrieved November 24, 2010. ^ "Chart Stats - Los del Rio". chartstats.com. Archived from the original on July 21, 2012. Retrieved November 24, 2010. ^ "Los del Rio Album & Song Chart History - Hot 100". Billboard. Retrieved November 24, 2010. ^ "Los del Rio Album & Song Chart History - Adult Pop Songs". Billboard. Retrieved November 24, 2010. ^ "Los del Rio Album & Song Chart History - Latin Songs". Billboard. Retrieved November 24, 2010. ^ "Los del Rio Album & Song Chart History - Pop Songs". Billboard. Retrieved November 24, 2010. ^ "RIAA - Gold & Platinum - November 24, 2010: Los del Rio certified singles". Recording Industry Association of America. Retrieved November 24, 2010.